“Baby’s First Felony” is Alaskan author John Straley’s first Cecil Younger adventure since 2001. “The Music of What Happens,” the third in the series, won an MBTB star way back in the late 90s. Straley sets his series in Sitka, a place far removed from the picturesque town the tourist boats tramp all over. Cecil’s Sitka has problems: crime, drugs, angry people. But it has community and acceptance of eccentricity. For instance, although they are the same age, Cecil has taken on responsibility for Todd, a man somewhere on the autistic spectrum. Cecil helps Todd navigate the shaky steps of survival. His wife, Jane Marie, and daughter, Blossom, also become part of Todd's family. Cecil has sympathy for Todd because he knows what it’s like to need help. Cecil is an alcoholic who has been dry for a long time. Now comes a case that will try his commitment to sobriety. Drug kingpins and their minions are nasty people. People may have been murdered to protect the new local product. Cecil becomes involved in their world when a client mysteriously winds up with lots of money and her mean boyfriend winds up with lots of attitude. Although it is not obvious at first, Cecil learns that Blossom’s friend Thistle has gotten caught in the muddle. Jane Marie has been along for some of Cecil’s adventures, but now it’s thirteen-year-old Blossom’s turn. She is rebellious, stubborn, and temperamental. Cecil is at a loss. When he becomes busy as an investigator with the public defender’s office, he shelves the problem of what to do with Blossom. Then one of his cases rams right into his personal life when Blossom is kidnapped. Will he meet the untenable demand the kidnapper makes in order to free his daughter? Cecil’s dilemma is heartbreaking. Cecil calls on a lot of his office’s former clients, most of them homeless, a lot of them still alcoholics and addicts, for help. Their plans are ingenious and hare-brained. In the end, Cecil survives by the kindness of others. And that, in a nutshell, is what is glorious about Straley’s books. He calls on the kindness of others to reveal itself in his stories. 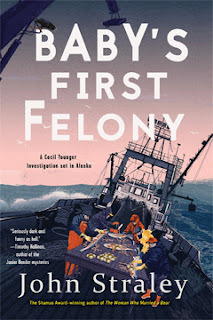 “Baby’s First Felony” is also the name of a handout Cecil’s office gives to first-time offenders seeking lawyerly advice. Straley reveals the rules contained in the handout throughout his book. Unfortunately, Cecil eventually finds himself in need of that advice. In fact, the narrative is Cecil’s allocution before his sentencing by a three-person judicial panel. Sometimes it’s hard to remember that Straley is using this gimmick until Cecil’s occasional “Your Honors” intrude. However, this gimmick serves to start the story off with an intriguing premise: Cecil has been found guilty of something and he is about to receive a sentence for it. That is where his mitigating statement comes in. I’m glad Cecil is back. He has a unique, philosophical voice for a hard-bitten private eye. 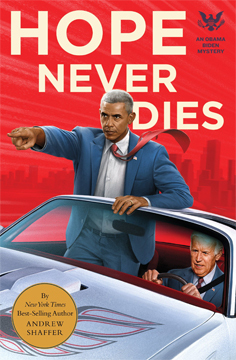 I was sometimes entertained by Andrew Shaffer’s novel, “Hope Never Dies,” starring the avatars of Joe Biden and Barak Obama. The book wasn’t overly political, there was a lot of humor and bro-buddy badinage, and Biden’s Jimmy Buffet wardrobe was infecting the imagination. That is, I was mostly entertained until Barak Obama gleefully whomped a witness upside the head with a shotgun. Whaaaaat? That was one toke over the line, buddy. With “Hope Never Dies,” Obama can join the presidential mystery club, currently populated by Roosevelt and Lincoln (and his vampires), even though it is former vice president Joe Biden who is the narrator of the book. I will be awaiting the inevitable effort by Shaffer or someone else at making Donald Trump and Mike Pence into crime solvers. I love the dramatic title of this book, “White River Burning.” The fictional town of White River is set in upstate New York, and it is burning because of race riots. The situation may become even more combustible if the murders of two police officers and two African-Americans are not solved. Call in Dave Gurney because he’s, you know, Dave Gurney. I guess “Newark (No, Not the One in New Jersey; The One in New York) Burning” just doesn’t have the same ring. John Verdon’s books are thorough, thought-provoking, intelligent, clue-laden, psychopath-laden, and entertaining. 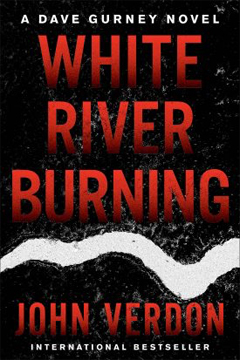 “White River Burning” is the sixth book in the Dave Gurney series. It is remarkable that Dave survives his cataclysmic adventures. I also tune in each time fully expecting the faithful and gentle Madeleine, his wife, to come a cropper or die. Surely, I think, in the course of these intense adventures, one or the other will not survive. Madeleine is mostly a spectator and solid shoulder for Dave to lean on. But it wasn’t always so. She’s had her share of close calls and been more of a cold shoulder occasionally. Their relationship is the solid base now from which Dave can travel into scary/crazyland. After a police officer is shot by a sniper at a demonstration protesting the death of a black man at the hands of the police (#blackwhiledriving), Dave is called in by the nervous District Attorney, Sheridan Kline, to do some investigation. Dave has been retired from the NYPD for a while, mostly so he can give his obsessive nature a rest and save his marriage. He was a much lauded investigator and cleared a high percentage of his homicide cases. (To Verdon's credit, he shows Dave's method.) Having just put his most recent case to bed ten months earlier, he reluctantly agrees to help Kline. It soon becomes obvious that Kline does not control the situation. White River Police Chief Dell Beckert is the man pulling the investigative strings. He calls many conferences of “his team” (Kline, Dave, Deputy Chief Judd Turlock, Mayor Dwayne Shucker, Sheriff Goodson Cloutz -- a blind, racist lawman used to doing things his way -- and out-of-his-depth CIO Mark Torres). There are more. Many more. Some of them have obsessive-compulsive tendencies. I think Verdon must have meticulous habits himself to create such a complex tale and draw all the skeins together. And it’s not just Verdon’s storytelling that is first-rate, but also his vision of why good people must exist and why they must persist to save humanity in whatever small or large ways they can. Dave is a person to follow to the ends of the earth. So all Dave has to do in this novel is find out who is targeting cops, quench the rioting, determine if there is corruption in the police department, keep the case out of the feds’ jurisdiction, find out who killed two black men, maybe track down two crazy white men with a lot of dynamite, and check to see if all of these far-flung cases are related. Verdon once more reminds us that Dave looks like Daniel Craig. Yes, I hope Verdon gets a movie deal and Daniel Craig plays Dave. If not Craig, then the actor must evince a stone face and convincingly shoot from the hip, to pile on the cool-hand tropes. That’s not asking too much. Jeong You-Jeong (or Jung Yoo-jung) is a South Korean writer. 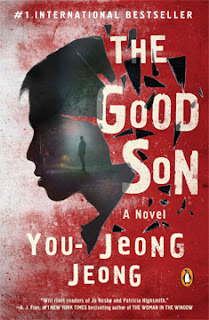 “The Good Son” was translated from Korean and has Korea as a physical and cultural background. But Jeong has done a remarkable job of writing a book that crosses cultures. Yes, family rituals are different, the food is different, the names are different, but psychopathy is reassuringly cross-cultural. One morning, Han Yu-jin wakes up with the smell of blood in his nose. That is because there are copious amounts of blood on him, on his bed, tracked on his floor, and smeared and puddled all over the home he shares with his mother and adopted brother. What has happened, he asks, as panicked thoughts flit around in his head. Did he have a seizure? Yes, he feels that he indeed did have a seizure. Where is the blood coming from? He has no injuries himself, so he warily backtracks the bloody footprints. And there is his mother lying on the floor, dead, murdered. Would he be dead, too, if it were not for his seizure? He can’t remember anything from the night before. Yu-jin is twenty-five years old and trying to enter law school. He had been aimless, but working towards law school has given him purpose. Now he has a different purpose: He must find out what happened to his mother. His older brother, Kim Hae-jin, is working on a film shoot and won’t be home for awhile. Hae-jin has been living with Yu-jin and his mother since his adoption ten years ago. Yu-jin’s father and biological older brother died from drowning sixteen years ago. Hae-jin has filled a hole in everyone’s heart. Auntie Hye-won rounds out the small family. She is a child psychologist and has been treating Yu-jin’s seizures with medication. Of course, Yu-jin rebels at taking the medicine. It makes him feel flat and dull. He occasionally stops taking it and, with heightened awareness and energy, he roams the town at night, mostly running up to a nearby observatory. But then a seizure levels him out and the treatment begins again. That’s where things stand until the fateful morning when Yu-jin awakens with the smell of blood in his nose. As author Jeong craftily reveals more of the stories of Yu-jin, Hae-jin, dead brother Yu-min, and Yu-jin’s past prowess as a high school swimmer, it is remarkable to see how she constructs the increasing tension. “I’m not crazy, you’re crazy” is what you think every character is saying. Well, someone is cuckoo for Cocoa-Puffs. Shades of Renfield and Norman Bates, Jeong’s psychopath has a mind ready to peel like an onion. 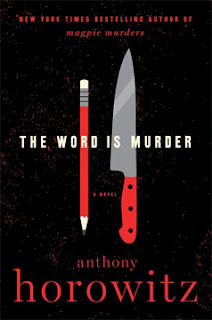 “The Word Is Murder” is about a writer named Anthony (definitely not “Tony”) who has just released “The House of Silk” (2011) and has written several kids’ books featuring a character called Alex Rider. Hey, ANTHONY Horowitz wrote a book called “The House of Silk” (2011) and writes a kids’ series starring a character named Alex Rider. "Anthony" wrote “Foyle’s War” for television. Anthony Horowitz wrote “Foyle’s War” for television. You get where I’m going. More importantly, you get where Anthony Horowitz is going. I had to check the front cover for the tiny words balanced between the pen and the sword (the pencil and the knife), “A Novel.” But nowhere in the book does Anthony divulge his last name. Plausible deniability. So fictional Anthony meets Hawthorne, the disgraced ex-Met homicide detective. Hawthorne suggests Anthony write about a current case for which he is a consultant with the London police. Sort of like Sherlock Holmes is called upon to consult with the London police. You mean write about the step-by-step method Hawthorne uses to solve (it is hoped) the case? Like Watson wrote about Sherlock’s cases? Indeed Hawthorne bears a strong resemblance to Sherlock: He is a keen observer, has a organized mind and an inability to communicate his “obvious” thought processes to his scrivener without making the scrivener appear to be an idiot. All the clues (sort of) are there should we wish to make the same deductions. A woman, a camel, and a lump of Play-Doh walk into a mortuary. Now erase the camel and lump from that statement. It’s not a joke. The woman has come to discuss her own funeral service with the mortician. She has precise wishes involving a trumpet voluntary, Sylvia Plath, and “Eleanor Rigby.” A few hours after concluding her meeting, she is murdered in her home. Diana Cowper’s wishes are carried out to the letter when she is buried about a week later. Her famous actor son, Damian, has flown in from America to mourn. He has brought his photogenic wife and baby daughter. The body has not completely settled into its new residence when a second murder is committed. Digging into all aspects of Diana’s life uncovers that about ten years ago she hit two boys with her car. One of them died and the other is permanently disabled. The last text message Diana sends is to her son. In it she says she feels threatened by the “boy who was lacerated.” Could that be a reference to the surviving son, who would be about eighteen years old? No doubt the unlucky Godwin family has suffered and not just because young Jeremy, the boy who survived the car accident, needs continual care. The parents eventually separated. The young nanny who witnessed the accident feels guilty and she has stayed on as Jeremy’s caregiver. Alan Godwin, the father, has written a threatening note to Diana and has demanded money. Throw in a sneaky house cleaner, a smarmy theatrical producer, a melancholy daughter-in-law and her protective parents, an egotistical son and the resulting mix has suspects galore and a red herring or two. Yay! And, yes, third and fourth murders are clearly in the offing. Yay!! Anthony, the fictional writer, plays his part of the smart — but not as smart as Hawthorne — guy very well. After all, he is a successful writer of mysteries. Why shouldn’t he make a good detective as well? In the language of mystery books, the mystery Boswells are always doomed to play second bananas, and ones rife with weak spots and less a-peeling logic. It’s the trope and it comes with the territory. I have to confess that I fell into thinking about the same scenarios that “Anthony” comes up with, ones that are disabused by the blunt and still-waters-run-deep Hawthorne. Why is this book set in 2011? This is what I thought. “Anthony” is looking to break into the adult fiction world. Although “House of Silk” is being released, he must continue to come up with ideas for new books. That’s my thinking, at least until Hawthorne disabuses me of it. This book was very enjoyable, albeit a little strange for Horowitz having inserted his avatar in the proceedings. Like a dark, glittering magnet Los Angeles has drawn the attention of many a crime writer. We’ve seen versions of the city by Raymond Chandler, Michael Connolly, Robert Crais, James Ellroy, Erle Stanley Gardner, Timothy Hallinan, Joseph Hansen, the Kellermans, Ross MacDonald, Walter Mosley, T. Jefferson Parker, and a cast of thousands. Their stories are iconic. It's hard to envisage a compellingly different take on the "City of Angels." What can Maria Hummel’s museum copyeditor protagonist add to the mix? Maggie Richter, whose name is not revealed until a quarter of the book has passed, moved to Los Angeles with a man she met in Thailand. Although she is an East Coaster, something bad happened there. That is why she ran to Thailand, and that is why she is still running. But she is a copyeditor in a contemporary art museum in Los Angeles, so how bad could it be? There presumably is no one chasing her. Maggie has lots of friends who also work at the Rocque Museum. She does spin classes with some of them. She drowns her sorrows — especially after her boyfriend dumps her — with some of them. She gossips with some of them and comments on their clothing. Surely this is a chick lit book. Much of the book comes across that way. (And don’t get me started about the “dumb girl going down to the basement where the serial killer is hiding” scenario this book incorporates at the end.) However, author Hummel writes passages that transcend the ill-fitting chick lit label. Maggie’s ex-boyfriend, Greg, is now the boyfriend of a former enfant terrible of the art world, Kim Lord. She is trying to make a comeback by exhibiting at the Rocque her newest venture, Still Lives, a series of provocative paintings of women who were murdered, women who were famous for being murdered. Then she disappears, right before the gala at the museum to celebrate the exhibition’s opening. Greg has been arrested and, of course, he wants Maggie to help him. Maggie, the broken-hearted idiot, agrees because she knows deep down he couldn’t have had anything to do with Kim’s disappearance. Yawn. Novels now bothered me — too much invention in the narrative felt like a meal with too much sweetness. In the Fitzgerald biography, I had to turn back to the spot where Scott meets Zelda and start all over, only this time their early fascination with each other — their late-night parties and jumping into fountains — didn’t seem giddy and romantic but vain and silly, as if they refused to see the disaster of their lives ahead. No one knows how to respond to this comment, not coming from Jayme, whom we all admire, and who is so private that she works out at a different gym from the rest of us and never stays at happy hour for more than one gin gimlet. Even trickier, we do know what Jayme means — what it must have cost Kim Lord to inhabit these murders — yet saying it aloud strips away the safe armor of our own intellectualization, the same armor that got us through the Jason Rains show on capital punishment, when we each allowed ourselves to sit in a lethal injection chair and watch the syringes come closer. 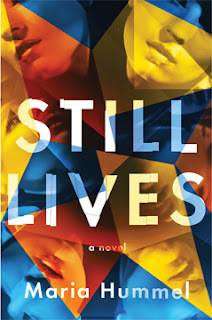 Still Lives is art. Art should shock us. We work at the Rocque. “Still Lives” is worth reading because Maria Hummel has potential. Are you a fan of the Tour de France? If you do not know what the Tour is, then perhaps you might acquaint yourself with a brief description before reading this book. I suppose it’s possible to read this book without knowing. But then the question doesn’t become what the author wants the question to be. It becomes, instead, why would anyone do that? Actually, that is one of the questions, but it should come from a different place. Solomon rides as the domestique for Fabrice in a cycling team sponsored by a chicken parts company. 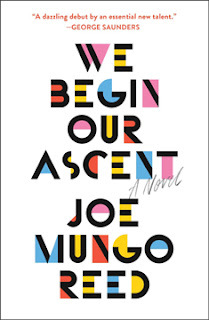 It’s not a humorous book, but there are a few times when Joe Mungo Reed inserts a wry observation or dialogue. Fabrice is the star and he is the one upon whose hopes the chicken parts lie. Solomon and Tsutomo are the riders who are there to enable Fabrice’s win. He drafts behind them. They fetch water and nutritional gels for him. The riders must give their all to the sport. They must live the sport, eat for the sport, sleep for the sport. The fact that Solomon has a wife and baby is an anomaly. But he, too, is pledged to cycling as a quest, as a religion. As such, there are some heavy questions in the book. Why does Solomon ride? What does it satisfy in him? Is it caprice? Vanity? A habit? The money? The whole book is devoted to what makes Solomon ride. I found the book thoughtful and sad. Apparently author Reed is not himself a competitive cyclist, but he appears to have captured the anxiety of the sport. Does Solomon find the answers to his questions? 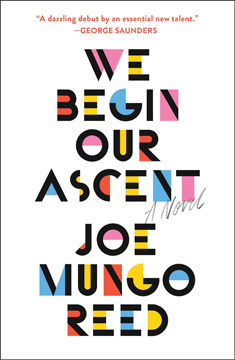 Well, the title of the book is "We Begin Our Ascent." Synesthesia has been the disability-du-jour for awhile now. It used to be Munchausen syndrome by proxy. I enjoyed the use of synesthesia in T. Jefferson Parker’s “The Fallen,” “Still Waters” by Nigel McCrery, “Wife of the Gods” by Kwei Quartey, and “Spark” by John Twelve Hawks of the books I have reviewed over the years. 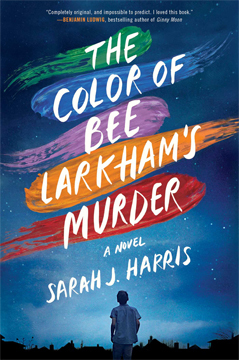 In “The Color of Bee Larkham’s Murder” it is coupled with autism and face blindness. Strangely enough, I just read another book in which prosopagnosia plays a big part, “Shutter Man” by Richard Montanari. Maybe that’s the new disability-du-jour. “Bee Larkham” borders on being a young adult book, but there are difficult situations that propel it into the adult realm. Part of the reason the book sounds young is that the narrator is thirteen-year-old Jasper Wishart. He is the character endowed with synesthesia, hobbled by prosopagnosia, and agitated by autism. It must have been extremely difficult to write from the perspective of a character with such limits of expression. Everything is viewed through the lens of seeing colors when he hears sounds. Shapes also conjure colors, but it is the colors-sounds bond that is at the heart of the book. Jasper doesn’t even recognize his father’s face. Ed Wishart has to announce that he is Jasper’s dad or that Jasper is his son. Jasper also recognizes the sound of his voice by its color (muddy ocher). His mom’s was cobalt blue, a color that resurrects her for him temporarily. She died a couple of years before this story begins, and he and his father have moved into a new neighborhood. A couple of other people have also recently moved to the neighborhood: the eponymous Bee Larkham because her mother has just died and she must sort through her stuff before selling the house, and Ollie Watkins whose mother is terminally ill and who needs his care. The two mothers were friends and Bee (sky blue) and Ollie (custard yellow) grew up on the street. David Gilbert (red grainy) is another neighbor, but he is more a contemporary of their mothers than of Bee and Ollie. The other significant residents are the colorful — in more ways than one — wild parakeets that nest in Bee’s oak tree and eat the food Bee leaves out for them. They are loud and squawky and the provocation for contentious neighbor complaints, especially from David Gilbert. But they are the target of fascination for Jasper. He keeps numerous notebooks and paintings describing when he sees them and what colors their sounds evoke. As a byproduct, Jasper notices other goings-on in the neighborhood while he is watching his beloved birds through his binoculars. He is right across the street from Bee and she often waves to him. His “spying” doesn’t seem to bother her, and soon she and Jasper have become friends, of a sort. She certainly isn’t friends with David Gilbert or Ollie Watkins. One day Bee disappears. Jasper claims she is dead. Soon we realize he thinks he has murdered her. As a result, he meets Rusty Chrome Orange, aka DC Richard Chamberlain (“like the actor” — not that Jasper knows what that means). Although Jasper’s thinking is fairly linear, the storyline isn’t. We work back from the beginning scene in the police station to when Bee is alive and rebellious. Why does she do what she does? That’s the tangled mystery, isn’t it? And we get to see it unraveling through Jasper’s prismatic eyes. A lot of the 386 pages of Sarah J. Harris’ book is repetition. We hear over and over about how Jasper does not recognize faces, that he is reliant on clothing and “voice colors.” We hear endlessly the colors of everything. I’m sure it reflects the redundancy of autism, but it doesn’t add to the literary value. Although I was quite enamored of her story, I disliked Harris’ excessive reiteration. I did lose my heart to Jasper, a vulnerable thirteen-year-old in a hostile environment at school and then, unfortunately, in his neighborhood. My heart twanged in response to Jasper’s attempt to keep his dead mother’s cobalt blue close to him, both in memory and in his compulsive paintings.